These notes are specifically about Green Lantern (Alan Scott) as he appears in Kingdom Come. 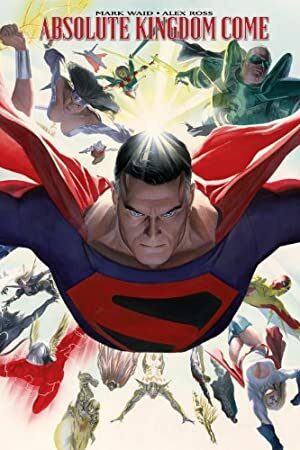 Published in 1996, Kingdom Come was a vision of a possible future of the DC Universe. This powerful story was quite influential, and several key DC writers considered that the DC Universe was indeed headed toward these events. Alan Scott is a living Green Lantern battery. He has internalized his piece of the Starheart, given to him by the Guardians of the Universe. He can call on its powers for amazing feats, the most astounding of which is his construction of New Oa, his orbiting space station. With the exception to his inability to affect wood, Alan’s powers are limited only by his imagination and the force of his mighty will. Alan Scott’s traditional history needs some pruning if he’s going to be affiliated with Oa and still have the weakness of wood. I’ve created the following elaborate bit of piecework from some clues and hints in the Kingdom Come novelization. Feel free to use or ignore. In the KC universe the Guardians made use of the magic they collected, since magic is only science we don’t understand. Alan Scott was selected in 1939 to become sector 2814’s Green Lantern, upon the death of Abin Sur. As Scott aged, he selected Hal Jordan to be his replacement and slid into retirement with his companions form the JSA. A crisis at Oa called him out of retirement in the mid 1990s. Sinestro was killing members of the corps and taking their rings in an effort to rewrite history and maintain his position in the Corps. Hal Jordan and his newly deputized would-be successor Kyle Rayner gave their lives defending the central battery against Sinestro. Alan arrived too late to save his friends. In order to combat the great power Sinestro had gathered Alan became one with the piece of the Starheart that was his lantern. This combined its mystic flame with the power of his own soul. This power allowed him to defeat Sinestro, but the damage to Oa and the battery was too great. The planet crumbled as the pieces of magic escaped the battery. Some believe that the energies influenced Sinestro’s plan because they were tired of being imprisoned by the Guardians. 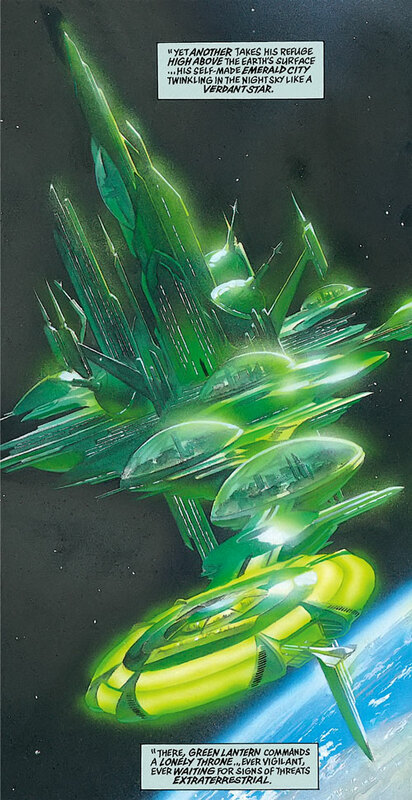 Alan then returned home and built his orbiting fortress named “New Oa”. He spent the next several years of his life there, watching for invasion from space and conducting various scientific experiments for the betterment of mankind. No crab-face masks for this guy, no siree ! Alan wears bright emerald full plate armor made from the material of his lantern, the flame from which he had taken inside himself. For nostalgic reasons more than anything else he wears a green domino mask similar to that once worn by Hal Jordan. Lantern is very aloof and distant. In fact, if the time is before Kingdom Come, he’s up there in orbit and probably won’t have much interaction with anyone else. GL is a bit too powerful, in my opinion, to be given over to player characters, but post-KC he may provide the GM with a wonderful deus-ex-lantern plot device. Alan’s daughter, Jade, survived the events of Kingdom Come, but his son, Obsidian, apparently did not. What impact this will have on Alan in the long run is unknown. GL’s powers cannot affect wood in any way ; his Skin Armor, while actual physical armor, does not protect him against wood-based attacks. Expansive Headquarters (New Oa) ; Iron Nerves ; Scholar (Bio-chemistry). Justice Society (High), Justice League (High), Jade and Obsidian (High). Authority figure (New Oa), Voluntary Exile (Earth), Guilt (loss of Oa, Destruction of the Corps). Helper(s): By Mark A Ayen. Source of Character: Kingdom Come.